Thanks to my wonderful sister Liz, I entered an online angel contest through OnAngelsMagazine.com I was fortunate to win second prize for my light painting of Mandolin Angel. I have long had a fascination with angels both here and beyond and feel them all around me. 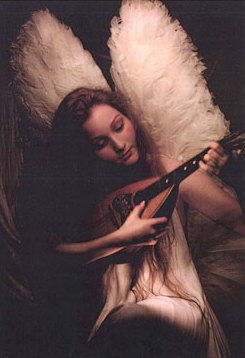 I had this vision of an angel quietly strumming a mandolin. Well it took me forever to find a mandolin, this one’s an oldie. I had been looking for a model with long red hair for quite awhile as well. Lo and behold I found this beautiful girl in the market one night as I ran in to get some bananas for my morning shake. I hesitated in approaching her, but I knew I would never forgive myself if I didn’t talk to her. She was most gracious and we spent two days together shooting. Oh and I made 5 different sets of wings including this one. That was quite a job, feathers everywhere!